Jason Krawczyk’s darkly funny and brutally violent HE NEVER DIED made its UK premiere at GrimmFest 2015, earning its place in the horror hall of fame as one of the best zombie/vampire films of the year. HE NEVER DIED tells the story of Jack (Henry Rollins), an isolated loner and social outcast who spends his days sleeping, watching television and playing bingo with senior citizens. As a 3000+ year-old vampire, Jack has no interest in forming any relationships but his routine is thrown into disarray when Andrea – the 19-year old daughter he never knew existed – knocks on his door. It isn’t long before Jack’s past soon comes back to haunt him, forcing him to break a few of his own rules in order to do what’s right. Funny, dark and grotesque, HE NEVER DIED is a refreshing addition to the noir genre. Writer/director Jason Krawczyk may still be relatively new to the craft but his cool, confident and darkly witty script makes HE NEVER DIED a polished gem of movie that is sure to entertain. HE NEVER DIED is loaded with enough blood, violence and action to satisfy the thirst of even the hardiest horror fan. There are some excellent gross-out gags, especially towards the end of the film when Jack’s hunger for human flesh continues to increase to uncontrollable levels. This grim black comedy also utilizes a great deal of sarcasm, especially in the interactions between Jack and his daughter. Punk legend Henry Rollins takes on the lead role as Jack, the cannibal with a conscious. The former Black Flag frontman fits the character in every sense, delivering the droll, deadpan dialogue with a deft comedic hand. His solid performance easily gets the big laughs and his impressive fight skills are mean, nasty and downright bloodthirsty. Rollins is joined by a strong supporting cast of talented actors and familiar faces. Jordan Todosey puts in a solid performance as Jack’s teenager daughter Andrea, her actively sarcastic streak playing off Henry’s more controlled character. Kate Greenhouse is also superb as Cara, the local diner waitress with whom Jack is quietly smitten. The interplay between Rollins and Greenhouse is both hilarious and touching and the chemistry between the characters adds a new dimension to the film alongside the violence and gore. HE NEVER DIED isn’t without its shortcomings however. Much of the action is off screen, presumably for budgetary reasons and the confusing sound design, which mixes together subway cars, chugging trains and neighing horses, is also a little over-the-top and distracting at times. That said, the material is constantly humorous and incredibly entertaining, with just enough twists and turns to keep you guessing to the very end. Dark, gritty and seriously funny, HE NEVER DIED is an accomplished piece of work by Krawczyk and a welcome addition to the horror noir genre. 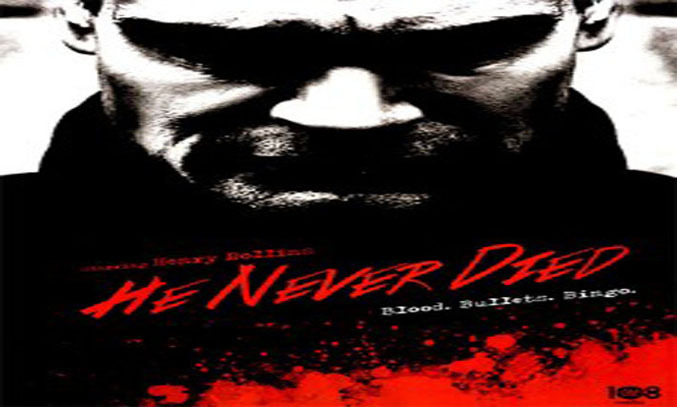 HE NEVER DIED made its UK premiere at Grimmfest 2015 on 2 October 2015.